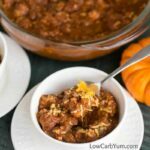 A simple paleo slow cooker beef chili that is quick and easy to prepare. 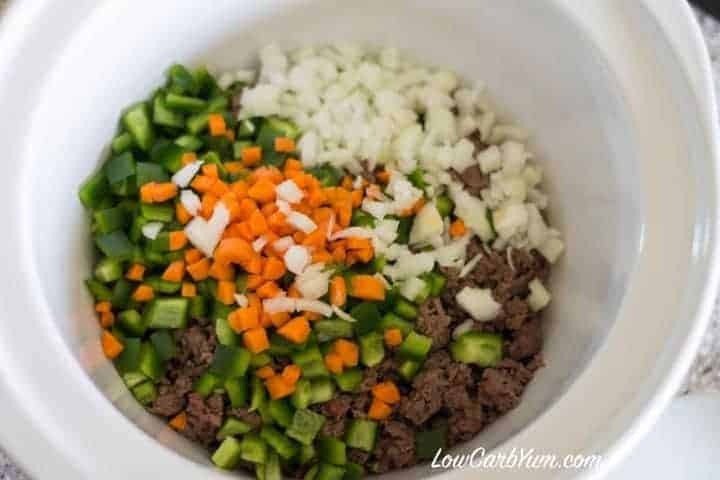 Prep time is about ten minutes then the beef chili slowly cooks in the crock pot. Although I grew up in the Northeastern part of the country, I’ve always loved Southern comfort foods. This is probably true of most folks. Since most of these dishes are loaded with carbs, it’s difficult to give up the comforting foods that have have roots below the Mason-Dixon line. 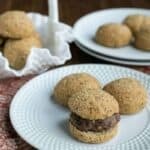 However, now that almond and coconut flours have become so popular, it’s easier than ever to indulge in Southern recipes while following a low carb way of eating! The Paleo diet seems to be everywhere these days. It does seem like a great diet because it pretty much eliminates grains, sugar and processed foods. The one issue I have with Paleo is that you have to give up dairy. I know there are lots of options when it comes to dairy-free, but I’m just not ready to give up all those delicious cheeses. Cheese is probably the biggest reason why I follow more of a Primal diet rather than Paleo. Another reason is the sweetener choices. With Paleo, you pretty much have to stick with stevia, honey, or fruit for sweetening your food. Now honey is a great option, but it’s just too high on the glycemic index to use regularly on a low carb diet. I received the new Down South Paleo Cookbook by Jennifer Robins a few weeks ago. Jennifer writes a blog at Predominantly Paleo. 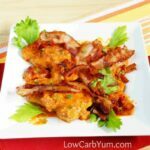 At first, I wasn’t sure if I’d find many recipes that I could adapt to my low carb diet. 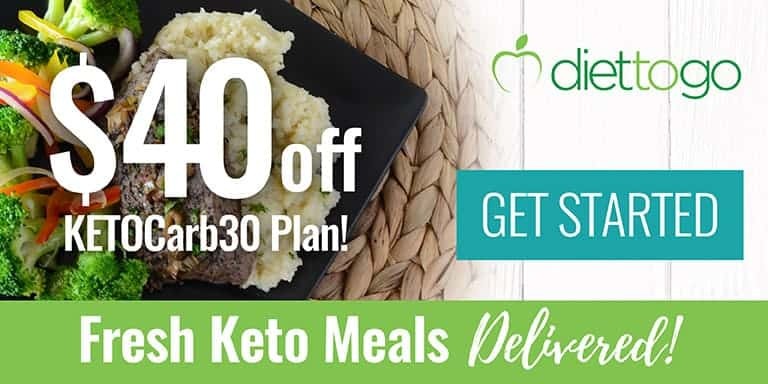 But, after flipping through the pages, I realized that there were some great recipes that could easily be adjusted to lower the carbs. 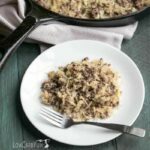 In the Down South Paleo cookbook, you’ll find over 100 recipes that are sure to make your mouth water. Everything is made with real whole foods. 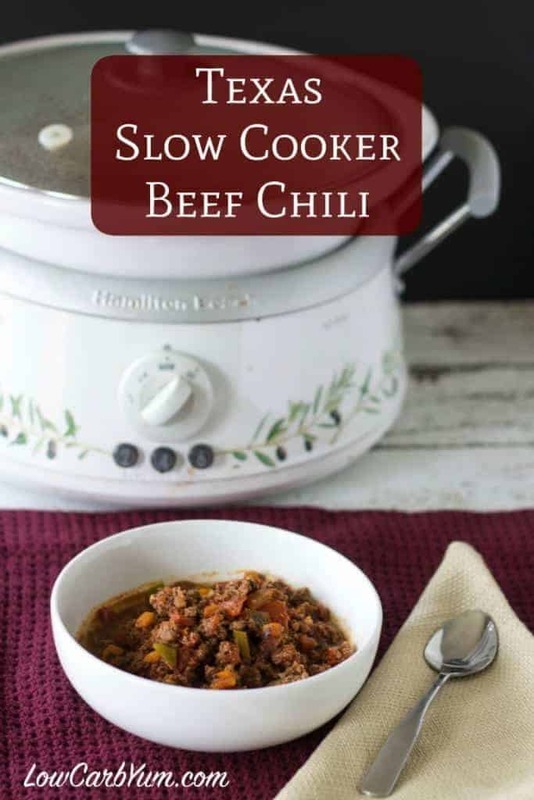 I chose to try the slow cooker beef chili recipe because I had most of the ingredients, including a counter full of tomatoes from the garden. The recipe does call for one large onion and four large carrots. To lower the carbs, I cut that down to half a small onion and four small baby carrots. 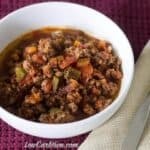 My husband loves to snack on baby carrots so I picked up a bag of these favorite treats for him and grabbed a few for the chili. 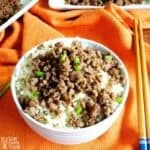 The thing I loved most about this recipe is that it is so simple! We were having people over so I prepared everything in the crock the day before and let it sit in the refrigerator overnight. Then, I just popped it in the crock the next day and let it cook on high for five hours. After the prep is done, the remaining time is just for slow cooking in the crock pot. To save even more time, I could have used the food processor to chop all the vegetables up, but I did most by hand. Tomatoes can be a bit messy when chopping finely, so I used the food processor to do those. 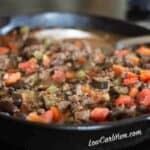 This chili recipe was a bit different that my usual blend. Since Jennifer grew up in Texas, I figured her chili recipe would be spicy hot. The carrots give it a sweet tone, but she provides optional topping to add heat if you like it. For me, this chili was best with the suggested sour cream and jalapeños added on top. I used regular sour cream since I don’t follow a strict Paleo diet. 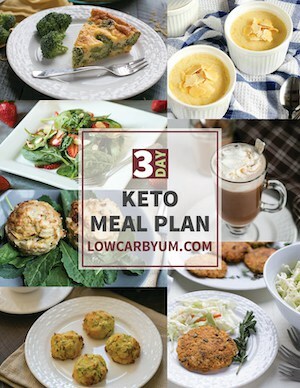 If you’ve been thinking about going Paleo or know someone who follows the diet, this is a wonderful cookbook filled with simple and easy to prepare comfort foods. Check it out today on Amazon where you can view some sample pages. Highly recommended! 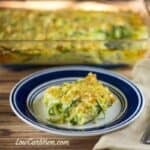 Top with dairy-free sour cream if desired, additional diced onions or jalapeños. I would like to make this however as I review I do not see any mention of a liquid. Is there any liquid used for this. Seems that it would need some to have the right consistency. The liquid comes from the tomatoes. 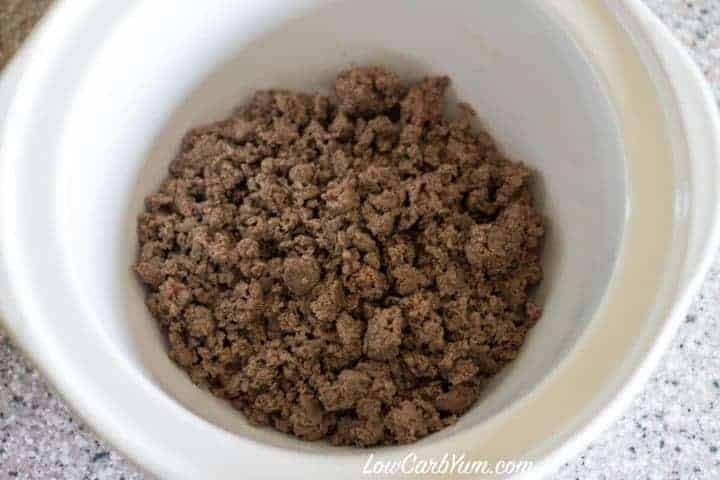 Do you know how long this would take in the Instant Pot? After using the saute setting to brown meat, I’d say about 15 minutes under pressure. It really should take long and you need to account for the up to pressure and release of pressure time. 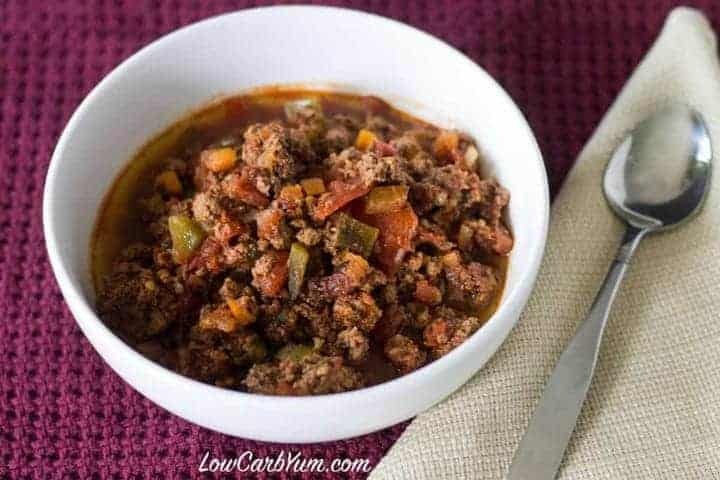 This is my favorite chili recipe! 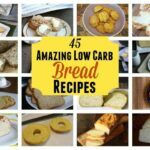 Even the non low-carb hubs loves it! 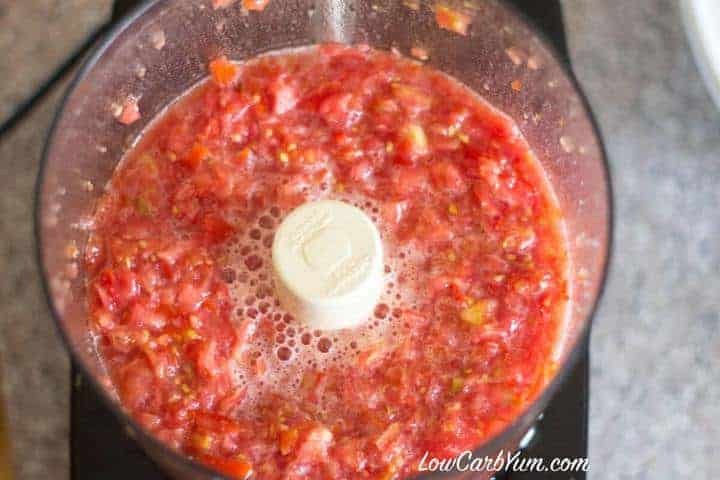 I use 3 large tomatoes in the blender instead of a can…. its amazing! 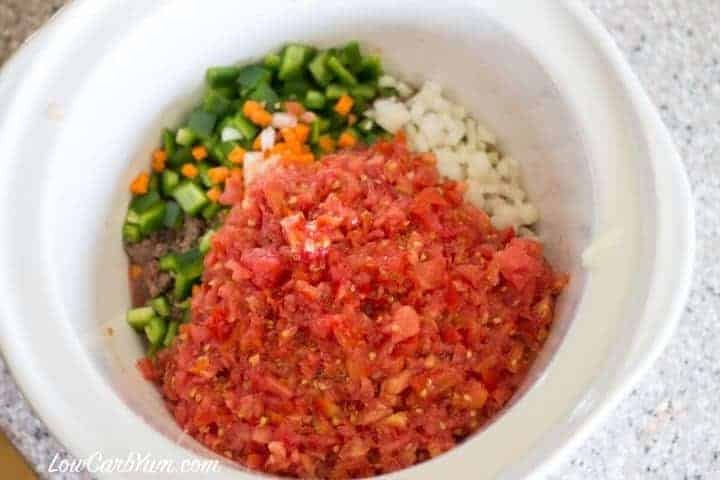 It is a fantastic recipe and fresh tomatoes are perfect for it. Excellent recipe! Added 3 Serrano Chili’s and 2 Jalapeños chopped up and it kicked up the heat a bit for those who like it spicier. Hi ! 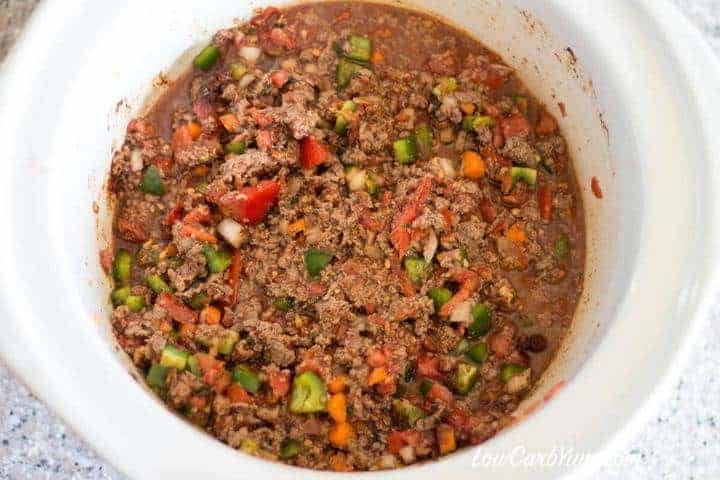 I’m making this chili tomorrow night and I’m so excited. Based off of the nutrition information, how much is in a serving?? It’s about 1.5 cups or a little more. 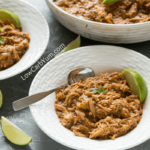 Any idea how to avoid the food smell when cooking in a slow cooker. Our house has a duck system. When I use slow cooker the smell travels all over the house. Any ideas how to avoid this smell? I don’t think so unless you move the slow cooker outside or into a room with no duct. This looks so delicious! Might need to add this to the menu this week! 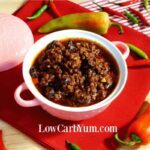 It is a tasty chili. Hope you give it a try!